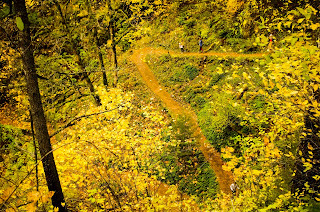 Illuminations from the attic: Fall hiking in the Columbia Gorge. Below my feet, the wooded slot canyon of Oneonta Gorge plunges to dizzying depths. A storm is blowing in and gusts of wind scented with autumn and tinted with rain fill the air with a rainbow storm of falling leaves. Loud with waterfalls; brilliant green with moss and ferns; bonsai trees clinging to the walls — the canyon is like something out of a fairy tale. 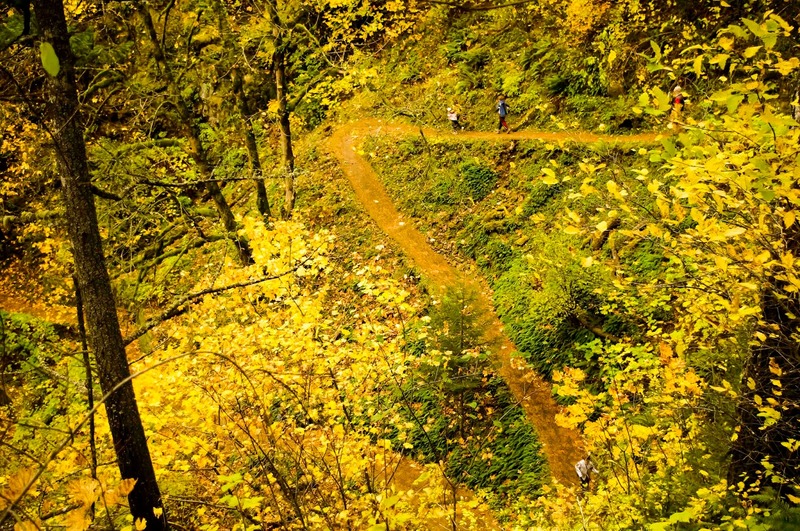 This is only one of the many great trails on the Oregon side of the Columbia Gorge. Even in winter this is one of the top hiking options of the Pacific Northwest. Not only is the scenery fantastic, but the trails themselves are an impressive feat of engineering. Built in the 1930's by the Civilian Conservation Corps (CCC), these trails not only provide easy, aesthetically pleasing walks, but also were part of the New Deal that helped to lift America out of the Great Depression. 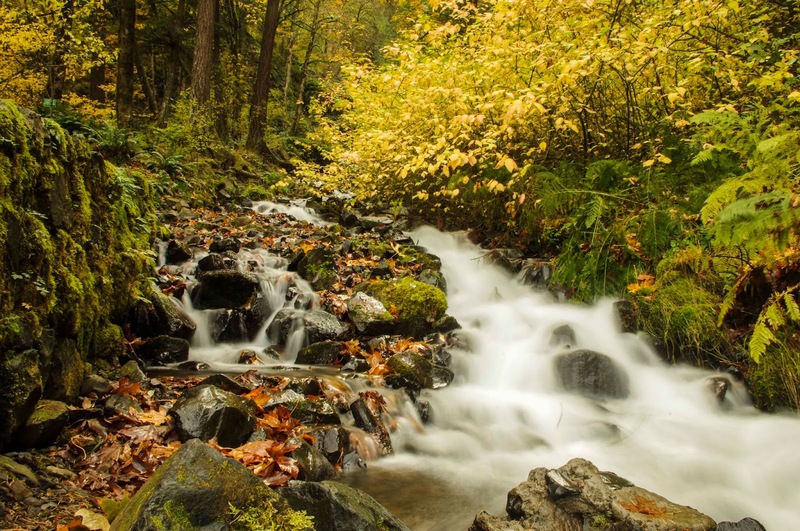 The camp at nearby Cascade Locks was the longest established CCC camp in the Columbia Gorge. Every year between 100 and 200 men worked on a variety of projects, including developing roads and trails and assisting in forestry management. The CCC had strict aesthetic rules on building design. For example, buildings below treeline were to be built of varnished timber, while buildings in alpine areas (such as the slopes of Mount Hood) had to be built of local rock. Possibly more important, however, was the education for the workers, many of whom were illiterate. The Cascade Locks Camp taught 33 subjects ranging from welding and basic reading and writing to ballroom dancing and stenography. The camp had its own newspaper, a recreation hall and an extensive library. They had athletic teams that participated in some of the local community leagues. At the end of the CCC era, America came away with two things: a better-educated working class and some of the most beautiful and long-lasting trails and roads in the world. 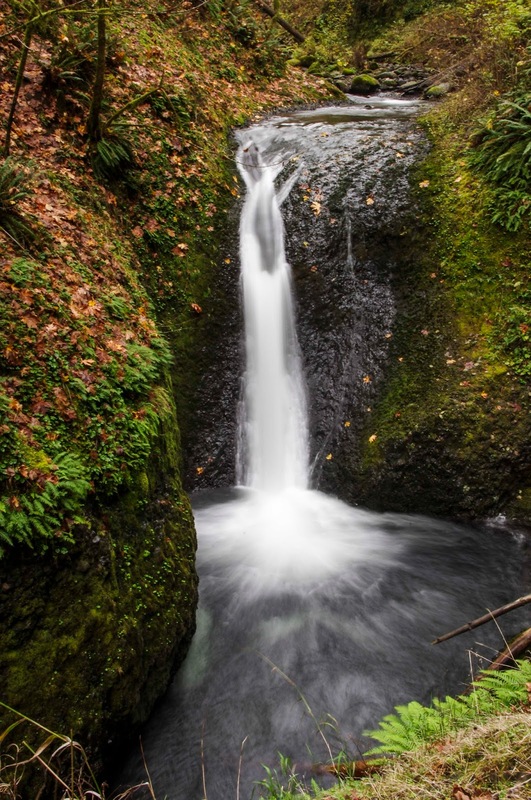 To see some of the best of the CCC's work, drive the Gorge scenic highway (eastbound Exit 28). 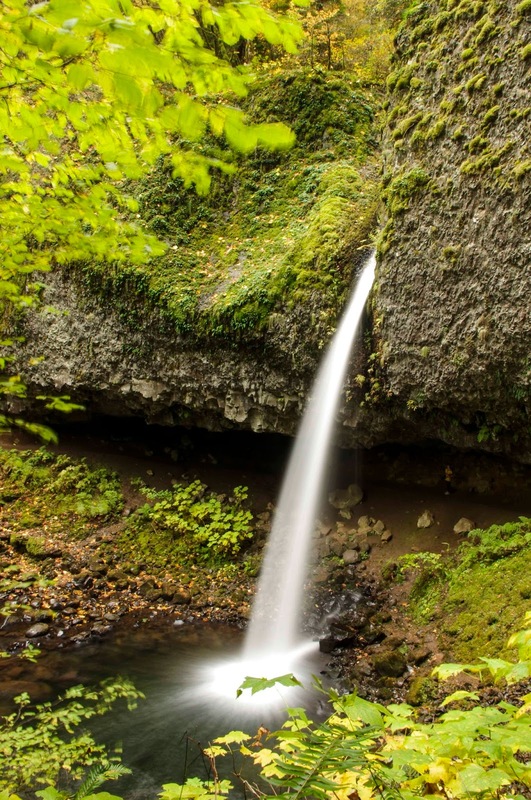 Many trails lead up from the highway past stunning waterfalls to high views of the Columbia Gorge and are superbly engineered, with graceful stone bridges and moss-covered rock walls. The trails are all interconnected above the road. Though this system may become confusing, it allows fit hikers to see all of the sights of the Gorge while doing the minimum of driving and parking on this scenic highway built in an age when both cars and people were thinner and fewer. The problem is that the trailheads are often poorly signed. Even navigating with guidebooks, we started at the wrong trailhead to Ponytail Falls and ended up walking more than a mile (though an extremely scenic mile it was) to get there, when we could have reached it in a quarter of the distance by starting at the Horsetail Falls Trailhead. Whichever route you travel, Ponytail Falls is worth investigating. The trail weaves behind the falls, a jet of water flying out above you and echoing around the shadowy grotto. If you have started from Horsetail Falls keep hiking. Past Ponytail, skirt 300 foot high cliffs before descending into the slot canyon of Oneonta Creek where a high bridge crosses the swirling canyon depths and provides a front-row seat for viewing Upper Oneonta Falls (the lower falls are not visible from the trail — to see them you must wade Oneonta Creek at low water half a mile up the canyon). For those desiring a longer trek, the trail to Triple Falls continues another mile up the creek. The CCC also worked on the campground and trail at Eagle Creek, near Bonneville Dam. The Campground was the first built in a National Forest. The trail and campground themselves were originally built in 1916, but were improved 20 years later by the CCC. Starting at the campground, the trail winds its way past deep pools and thundering falls — and along sheer, 300-foot cliffs from which the trail was blasted. Fortunately the tread is wide and a strong cable is provided for the faint of heart. It is somewhat disconcerting, however, while mildly acrophobic hikers are clinging to the cable, feeling as if the slightest breeze would blow them into the abyss, to have a group of kayakers jog past, their kayaks slung casually over their backs as though the gaping void inches from their feet wasn‘t even there. 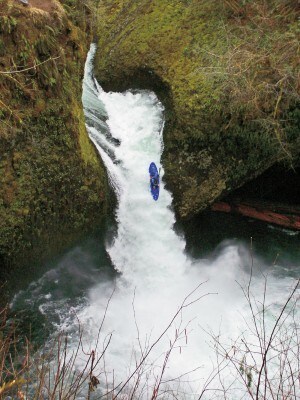 It is equally impressive to later watch them paddle over roaring Punchbowl Falls into the churning pit below. 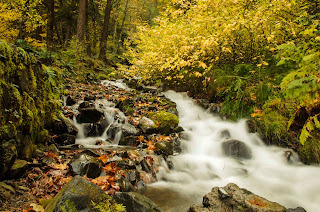 The gorge trails provide a winter haven for hikers trying to avoid the high mountain snow, but be prepared for the leaf twirling, ear biting Gorge wind that will help keep tourists at bay and remind you that it is still winter here, too.